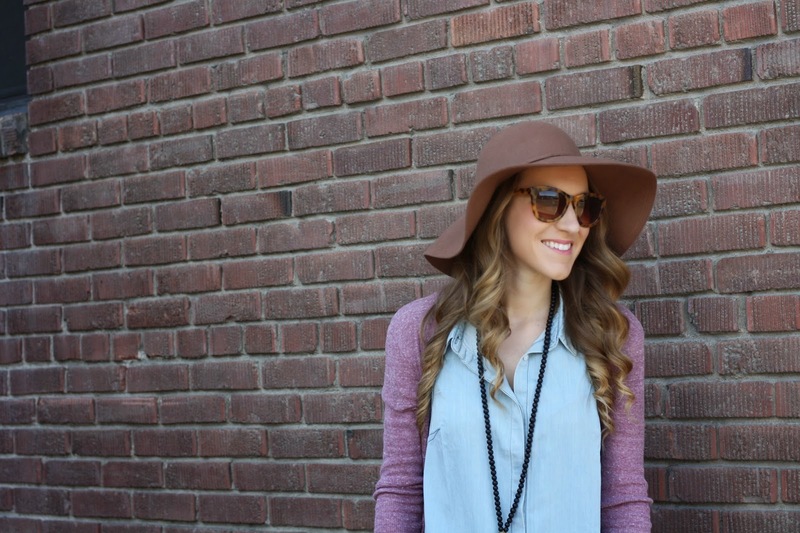 Maxi Cardi and Denim featuring Red Clover Boutique + a $50 Gift Card Giveaway! Spring has sprung in my hometown! Although it isn’t officially ‘spring’, the weather has been insanely beautiful and I have taken full advantage of it! I even went as far as to pack up my winter clothes, so the weather better not play any tricks on me!! This outfit truly sums up my spring staples – a denim dress, a long cardigan, brown booties and tassels! I picked up this cardigan last spring in a few colors and wear them ALL the time! They are one of the best pieces I have purchased as they are so cozy and lightweight. They are perfect for warmer months! I also love that it is a longer cardigan! Paired with my favorite brown booties (YES, I know…I wear these to death! Best purchase ever! ), a sweet tassel necklace and a floppy hat, I am spring ready! What really makes this outfit though is this denim dress. I will definitely get a ton of wear out of this in the coming months! It seems that EVERYTIME I get something from Red Clover Boutique, I have it on heavy repeat. They have the perfect mix of boho and trendy pieces that don’t break the bank! I am literally drooling over their new spring arrivals! One of each please?! I am SO excited to share with you today that Red Clover Boutique is offering one lucky reader a $50 gift card!! Just enter through the Rafflecopter below and follow the easy steps to be eligible to win! Giveaway runs from 3/12 to 3/21! I love this look! So so pretty! Great giveaway! Every time you wear that necklace I become more obsessed with it. So much that I emailed the company to order several things from there. Love love!